Get The Perfect Electricity Plan in Melvin, Texas! Choosing your electricity provider isn't always easy, but we can help! Find out why Direct Energy has already earned the business of more than four million customers across the United States and Canada. Even though we're among the biggest residential energy retailers in North America, we provide big-business know-how without giving up the commitment you'd expect from a small-town energy provider. See how we provide best in class solutions for our residential and business customers! Direct Energy is there for you, no matter what you need. With an abundance of specially-designed offerings across North America, we are your dependable go-to resource. 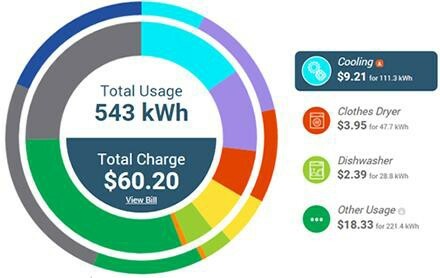 Understand your energy usage like never before with our insights, which will help you make smarter decisions, be more efficient, and spend less. In the Lone Star State, there is so much to do besides thinking about your electricity, like barbecuing with the neighbors! Rustle up great Texas value when you sign up with Direct Energy! We have great Melvin electricity rates and customer service that won't let you down. During the cold and windy Melvin winters, you shouldn't have to worry about your electricity bill. With the products and prices that are right for your home and your budget, Direct Energy offers you peace of mind. We offer a wide array of plans, from green energy to a fixed rate, which protects your rates when the seasons change and prices potentially skyrocket. With us, you can always count on competitive pricing and exceptional customer service, but the perks don't stop there. Once you've decided on your perfect plan, you can use our Online Account Manager to view your payment history, check out exclusive offers, and more. We provide the knowledge and tools to help you make better energy decisions and save money every month on your electricity bills. Get more for your dollar - head to our Learning Center to learn some simple ways to lessen your energy use. You have the power to choose your electricity provider, so why not choose the company that gives you the tools and technology to Use Less of What We Sell? Direct Your Energy, our easy-to-navigate usage insights tool, inspects your energy usage, helping you make informed decisions that can encourage you to use less. With our easy to use insights tool, you will receive a high-level view of your energy performance, predictive weather overlay, and more! Our Learning Center and blog also offer considerable tools for you to learn more about your energy use. Direct Energy is committed to helping you understand and manage your energy use and care for your home. Did you know that air filters help your HVAC system run more smoothly and efficiently and keep your family healthier? For real! And there is more information where that came from. If you've been researching TXU Energy, or other electricity providers such as Reliant Energy or Green Mountain Energy, look no further. Whether you need new service or you're switching Melvin electricity providers, trust Direct Energy to make the process easy. Looking for a plan with the stability of a fixed rate? Or maybe you like the freedom of a connected home bundle. No matter what your ideal plan looks like, we have the one for you. There are some things you can always count on, no matter which electricity plan you choose for your Melvin home - like fixed rates and an active social media community! Take advantage of our advanced technology and energy insights tool, Direct Your Energy, to understand and manage your energy usage. Access our library of resources to bump up your energy efficiency and save on your monthly bills. Unlike other electricity companies, we want to help you spend less money on your electric bill. Did you know that if you sign up to participate in the Reduce Your Use Rewards program and reduce your energy consumption at specified times, we'll give you a 10% discount on your next bill? We have everything you need to live smarter. Get started with Direct Energy today.